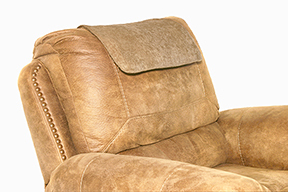 The new Audio Fox Undercover Wireless TV Speaker System delivers sound directly to ears, with stereo speakers encased in cushioned fabric that drape over the back of the chair. The stereo speakers are encased in cushioned fabric (either black, brown or tan) that blend with most furniture décor. 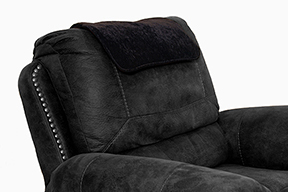 The speakers drape over the back of chair, providing sound directly to ears. Harris Communications, a leader in the field of assistive products for the deaf and hard-of-hearing, is carrying a new wireless TV speaker system for people with hearing loss. The new Audio Fox Undercover Wireless TV Speaker System gives personal control over the TV volume without the use of headphones. The stereo speakers are encased in cushioned fabric (either black, brown or tan) that blend with most furniture décor. 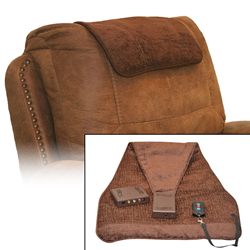 The speakers drape over the back of chair, providing sound directly to ears. A remote control will change or mute the volume for the user, while others in the room can listen to the normal TV volume. The dimensions of the fabric-covered speakers are 18" x 12" x 2.75". The fabric cover is not removable, but can be spot-cleaned with a damp cloth and detergent. The Audio Fox Undercover Wireless TV Speaker System with 2.4GHz Radio Frequency (RF) technology retails for $249.95. Included in the system are: Speaker Receiver, Transmitter, Remote Control, RCA/Coax audio cord, Toslink fiber optic cable and 2 AC adapters. For more than 30 years Harris Communications has been providing assistive devices for the deaf and hard-of-hearing. They offer affordable, flexible solutions for all levels of hearing loss and are an industry leader in this field. To discover what Harris Communications can do for you or your loved ones, visit http://www.harriscomm.com.